As investigators revealed that a Teterboro air traffic controller making a personal phone call initially failed to warn a small plane of aircraft in its way, NBC New York has learned the same tower involved in the fatal collision over the Hudson had another piece of bad luck recently. The FAA confirms the only controller on duty on the overnight shift at Teterboro airport back on July 5th was inadvertently locked out of the cab, or work area, for 43 minutes. "There was an inconvenience, but he took appropriate steps," said FAA spokesman Jim Peters. He explained that the aging tower is undergoing "fire/safety upgrades" involving locking mechanisms for the doors. The lone controller on duty "heard a noise and was concerned someone was trapped in the elevator" one floor below. "He left the cab, went downstairs one flight, and found everything OK," said Peters. "The FAA spokesman says the controller believed he had left the door to his work area unlocked, but unbeknownst to him, someone had tripped the locking mechanism earlier. Immediately, the controller used his personal cellphone to call TRACON, the regional air traffic control center in Westbury, Long Island. "The controller explained what was going on. The controller at Tracon assumed responsibility for airspace" at Teterboro, said Peters. He added there were three planes in the air at the time, and all landed without incident at Teterboro. An airport employee then got the controller back inside. "There was an inconvenience, but [the controller] took the appropriate steps," said Peters, and the "case is closed." Meanwhile, the FAA has suspended two of Teterboro tower's air traffic controllers for being distracted during the tragic mid-air collision last Saturday that killed nine people. The controller on duty was reportedly talking to his girlfriend on the phone, and his supervisor was out of the cab. The controller making a personal phone call initially failed to warn a small plane of other aircraft in its path and then tried unsuccessfully to contact the pilot, federal safety officials said Friday. The National Transportation Safety Board said in a report that the controller — who has not been identified — cleared the single-engine Piper for takeoff at 11:48 a.m. EDT, and then made a personal call. He remained on the phone, including while further instructing the plane's pilot, until the accident occurred. After takeoff, the plane flew southbound until the controller directed it to turn left toward the river, the report said. At 11:52 a.m. the controller instructed the plane to contact air traffic control at nearby Newark Liberty International Airport, which monitors low-flying traffic over the river, but doesn't attempt to separate aircraft. Radar data show there were several aircraft immediately ahead of the plane, including the tour helicopter, "all of which were potential traffic conflicts for the airplane," but the controller didn't warn the pilot, the report said. It wasn't until controllers at the nearby Newark airport alerted the Teterboro controller to the potential collision that he tried unsuccessfully to contact the pilot, the report said. The collision occurred shortly after that. The air traffic controllers union strongly disputes the criticism of the Teterboro controller who was suspended for making a personal phone call while on the job the day of the crash. Controller Ray Adams, a spokesperson for the Newark Tower, told NBC New York that "there is no possible way the [Teterboro] controller could have called a traffic situation," because the Liberty Tours helicopter wasn't even on the radar. Adams also said the Newark Tower had no idea there was an imminent problem, because even if the "conflict alert" message had been indicated on flight control computer screens, that's such a common occurrence on heavy traffic days above the Hudson, it's basically blinking continuously -- and often ignored. 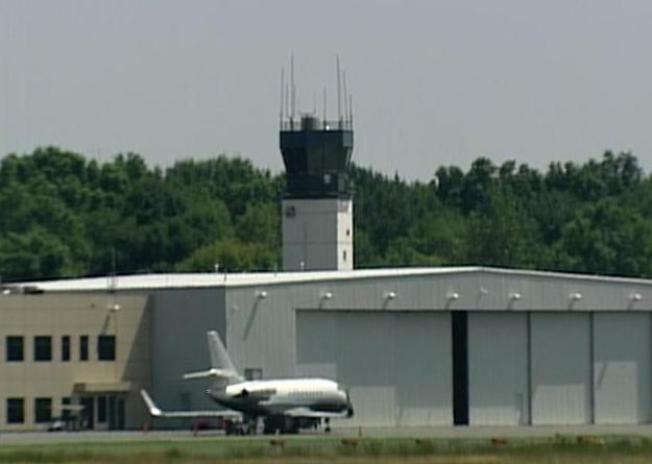 As for complaints that the Teterboro controller acted unprofessionally by talking on the phone with his girlfriend while interacting with air traffic, Adams said "the phone call did not distract from his duties." Transportation Department Secretary Ray LaHood has promised "action" in the wake of the findings, and the FAA is in the process of reviewing guidelines for operating procedures for the airspace over the Hudson River, which New York politicians have compared to "the Wild West."